MANROSE 1361 REMOTE HUMIDISTAT & TIMER CONTROLLER The Manrose 1361 Remote Humidistat Fan Timer is suitable for use with any single or combination of Manrose fans without shutters, providing the total electric load is not more than 200W. This control unit combines an over run timer activated by a switched live connection and an automatic humidistat. 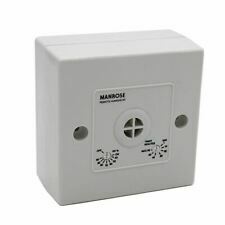 1361 Manrose Humidistat & Timer control This unit can be wired for use as humidistat only Can be fitted to work with fans and wired into the live supply of the fan Converts existing basic fan from most manufacturers to be humidity controlled Timer unit. Requires a permanent live, Switch live and neutral supply. 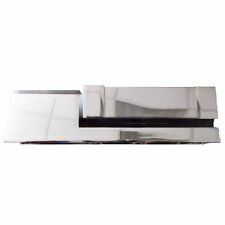 Slimline Model - only 15mm thick. High Quality Products at Great Prices. Overrun: 2-30 mins adjustable. Wall & Ceiling fan. This model includes ambient blue LED Backlighting behind the outer plate, resulting in a pleasant glow when in operation. LED Backlight. The smooth, attractively styled plastic casing is easy to wipe clean, and is double insulated, requiring no earth. 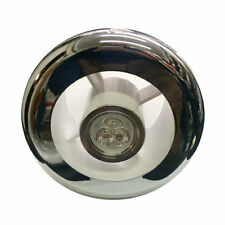 12 volt DC 3W GU5.3 sealed lamp. Cool white as standard. Hybrid propeller increases the flow and decreases the fan's noise. MOTOR ROTATION. 230/50 V/Hz. This model is for operation in conjunction with the room light switch. Sealed for life ball bearings Silent elastic blocks IP45 rated. This is how the grilles are. This is not a fault. Simply remove your existing cover and replace it with this one! 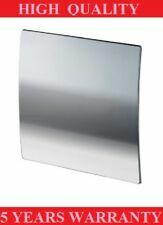 Used for passive ventilation, air intakes or with in-line fans. For internal use only. For use with 100mm / 4" ducting. Power output20 W. Noise sound pressure41dB(A). Extraction rate85m³/h. Weight (kg)0.6kg. Portable Ventilator Axial Blower Ventilation Extractor Industrial Fan 10/12/16"
It has a spigot connection on the rear to allow the fixing of either Aluminium or Insulated Flexible Ducting or Rigid Plastic Ductings. • IPX4 - electrically safe for use in the bathroom. • Ultra quiet. • Wall or Ceiling Mounted. • Extraction rate 97m3/hr. W15.8 x H15.8 x D3cm. Adjustable Humidity level between 60% and 90%. Zone 2 and Outside Zone Compatible. The VSL100TC is designed to be mounted in the ceiling through a 102mm cut-out. 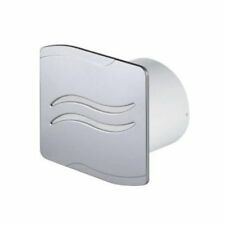 These bathroom accessories are supplied with wiring and installation instructions. • Fan Speed (rpm): 2400. 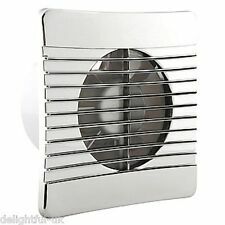 NEW HIB 33400 NON ILLUMINATED CYCLONE BATHROOM VENTILATION FAN CHROME Boxed New . Never opened, purchased for new bathroom but not needed. In original box, too late to return, grab a bargain. IPX4 – electrically safe for use in the bathroom. Discreet look. Manrose MF100T In-Line Extractor Fan with Timer 100mm/4" c/w Chrome Intake Grille These powerful in-duct mounted mixed flow fans have been designed to produce higher working pressures for applications that require high air flows, with low relative noise. MixFlo fans can be mounted in a variety of applications and are suitable for use with either rigid or flexible ducting. This product is manufactured by Manrose however these maybe supplied in own brand packaging. and may vary in colour. • High quality ball bearing, long life motors, continuously rated and warranted for a minimum of 30,000 hours or 3 years • High air flows are achieved through flexible duct • Compact overall dimensions • 2 speed settings • Double Insulation - no earth required . Requires a 100mm clearance hole in the wall. Fan unit as detailed above. Suitable for kitchens, bathrooms and toilets. Designed to be fitted into walls and ceilings. Modern design with built-in LED array, easy to wipe clean and duct over short lengths (2m max). WIDTH / DEPTH156 mm. GREENWOOD AFFRESCO. 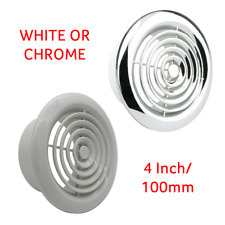 100MM WALL FAN WITH LIGHT (LAMP NOT INCLUDED). -INDUCT FAN & FIXING BRACKET. PRE ASSEMBLED FOR EASY INSTALLATION. WHEN MAIN LIGHT IS SWITCHED OFF, THE FAN WILL ALSO SWITCH OFF. 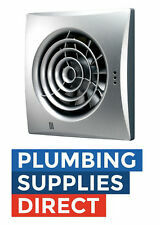 PRE ASSEMBLED UNIT THAT IS EASY TO INSTALL IN NEW BUILD OR WHEN REPLACING EXISTING FAN. Zone 2 and Outside Zone Compatible. Only 33 decibels. 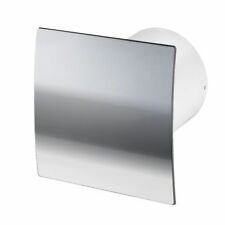 Manrose 120mm Shower Light/Extractor Fan .